Showing results for tags 'frozen heart'. Rasputina is a very polarized Master, in that her strengths are brutally powerful but her weaknesses are painful to deal with. She is the equivalent of a tactical nuke in the game, able to do massive damage to clumps of models from huge distances. She has access to Slows and Paralyzes to shut down what she can’t kill. She can make her models much more durable or block off massive amounts of the board. However, she’s painfully slow (Wk 3 and no Cg), and getting into engagements can be a serious problem for her, as most of her attacks are . She has ways of getting around both of those weaknesses, but they are only workarounds and rely either on taking certain models or upgrades. So we're all on the same page here, let's take a look at her card, as per Wyrd's website: CARD FRONT So that sounds cool and all, but what does Rasputina actually do? Well, primarily she kills things dead. Her crews are a bit unique in that she interacts not with a Characteristic like M&SU but instead with the Ability Frozen Heart. This Ability is pretty good on its own, giving the model immunity to Horror Duels and Paralyzed, but it’s the interaction Rasputina (and her Silent Ones) have with it that’s the real winner here. Rasputina (and her Silent Ones) have another Ability called Ice Mirror, which allows you to use an unengaged Frozen Heart model within 10” and LOS for determining the range and LOS of their Actions, massively extending the range of your abilities and allowing you to basically shoot around corners! Players of WM/H will feel comfortable with this ability by thinking of it like an Arc Node. If you choose to use Ice Mirror the Action gets -1 to Ca and can’t use triggers though. Since you're using the other model as the point of LOS, picking a Ht 3 or 4 model for this lets you also see over things Raspy wouldn't otherwise be able to! The synergy between these two Abilities really are Rasputina’s shtick, and they allow her to do enormous damage from half the board away and out of LOS of any enemy models. Rasputina’s stats range from bad to pretty okay, nothing really stands out here. Wp 6 is good, same with Wd 12, but the aforementioned terrible mobility and Df 4 is pretty painful when it matters. The other two abilities on her card help out a fair bit here though. She has a Df trigger called Sub Zero (it's not built in sadly) where if she takes damage from a Ml Action, the attacker's activation then immediately ends – so if an enemy Flurries on you and you get this on the first attack, they don’t get the other two attacks! Her last Ability, Counterspell, is a bit more niche: Ca actions against her lose their built-in suits. This is useful against other spellcasters like in the weird Raspy v Raspy game, but this won’t come up in most games. CARD BACK Now, while we’re going through her Actions, remember all of these can be Ice Mirror'ed to have ridiculous range. Her first Attack Action, Freeze Over, does no damage at all. Instead, the target and any non-Leaders in base contact with them immediately gain Paralyzed! Base range is 6, and it requires an 8. This is best used when targeting a friendly Frozen Heart model, as the opponent can’t defend against it (except by killing the model first) and your model’s immune to the Paralyzed so it loses nothing! Keep in mind you can't give Paralyzed to a Leader in base contact with the target, but you can Paralyse them if the Leader is the target. Her other main attack, December’s Curse, is the real winner though. Ca 7, Rg 12, and a 2/4/5 spread lets you put out some very nice and reliable damage. This comes with two triggers, both of which are amazing! They are Surge on a to draw a card, and Overpower on a to take the action again with no more triggers. Her last attack is also her (0), Biting Chill. Unlike all of her other Actions this is only Ca 5, bad range (2 and no ), and bad damage (1/2/2). On a trigger she gets to do it again though, and unlike Overpower this one can trigger repeatedly. This is essentially going to be used only if she gets stuck in melee. Her only Tactical Action, December’s Touch, lets you give a friendly model Armor +2 and Frozen Heart for a 4 at Rg 12. I'll be touching more on this one in the model synergy section, but for now just note that giving out both of those is really good! This also has the Surge trigger on a . PERSONAL UPGRADES The last things to go over with Rasputina herself are her upgrades, and hoo boy are they wonderful! They are very expensive though, with two at 1ss, three at 2ss, and one at a crazy 3ss. Like with most Arcanist masters, you're very likely going to be taking 3 upgrades on her every game, and each slot is quite competitive. Child of December is her Paralyze upgrade. It gives her the Ability Bearskin Armor, making her immune to damage from and which can be nice to have against certain crews and stops your own models’ Explosive Demise from hurting her. It also gives her another (0) called Shatter. This has a good Rg but can only target a Paralyzed model, and gives it an incredible to all duels for the turn! On a trigger you also get to do a flat 4 damage, and on a trigger you do 3 damage for every Upgrade the model has (yes, that can be 9 damage and on the enemy Master if you Paralyze them first)! Cold Nights is her control upgrade. She gains the Ability Ice Shield, letting her go to Df 8 against one Action but only if she then trashes this upgrade (very rarely worth it unless she's about to die). The real reason you take this though is for the Tactical Action Ice Pillars. These are Rg 12 (with a secondary restriction that they also have to be within 12” of the user so you can’t throw them super far forward) and they put down two 50mm Ht 5 Blocking Impassable markers in base contact with each other, effectively shutting down the enemy’s charge lanes and LOS without giving them Cover. It also has the Surge trigger on a . This is just such a great upgrade, I take it almost every game. December’s Pawn is a bit of a gamble. For 2ss you get only one Ability, with the same name as the upgrade, but it lets her count the Black Joker as if it was a Red Joker (note: it’s only her, so if another model flips it they’re still screwed). This is sometimes incredible, but it’s not very likely to have an effect most games. Enveloped in Ice is her melee upgrade. She gets +1 Wk and Armor +1, both of which are just flat out great to have. She also gets the ability In My Clutches, which is basically a once-per-turn Pounce. But why would that matter if she doesn’t have any actions, you might ask? Well, the upgrade also gives her one! Frozen Spear isn’t a super amazing attack, 95% of the time you’re still going to want to use December’s Curse. However, if the enemy is Slow or Paralyzed then they can’t reduce or prevent the damage from it! On a trigger it also Slows the target, so with this she’s surprisingly good at killing high Armor models in melee (she still has a Cg of - though). Frozen Servants is her summoner upgrade. This gives her and all other Living Frozen Heart models a (0) Consume the Fallen, which lets them eat nearby Corpse Markers for a surprisingly decent heal. The big thing here though is a pair of Actions called Icy Minions and December’s Fist. The first lets her summon a 3-wound Ice Gamin off of a Scrap Marker for a mid-, and the other summons a 6-wound Ice Golem for a high- and a Soulstone. She’s not really a Scrap Marker user outside this, but dropping little critters into the enemy’s crew is very nice, and this is generally believed to be the best way to make sure that your Ice Golem get engaged with your enemy. More on this in Tips & Tricks. Shattered Heart is her ranged upgrade, and is also the most expensive one in the whole faction. It replaces her Ice Mirror Ability with Shattered Mirror, which acts the same but doesn't have the -1 to Ca and it does let you use triggers (Actions that come from her triggers are at -2 Ca). This is the core of her “never move, only kill” playstyle and it turns her into one of the biggest ranged threats in the game thanks to the Overpower trigger on December’s Curse. It’s also a limited upgrade. OTHER UPGRADES Armor of December is the other limited upgrade she has access to, though it’s actually not exclusive to her – it can be taken by any Frozen Heart models (so her, Snow Storm, Blessed of December, and Ice Golem). It gives the tactical action Guarded Advance which pushes the model 3" and gives them Armor +1. This is what you'll take for her safer playstyle, since not having Shattered Heart makes her less of a ranged terror but also harder to pin down thanks to these pushes. Most of the time if you’re taking this, you won’t be taking Enveloped in Ice as they both kind of serve the same spot of getting Raspy out of engagement. The other upgrades she has access to go from solid to meh: Arcane Reservoir and Seize the Day are especially good, but neither is mandatory. Sub Zero is okay, but she really shouldn’t be near the frontline enough to be using this so someone else should be taking it if you want it. Imbued Energies for a turn of Fast is okay, but she already has a lot of really good upgrades. Imbued Protection, Recharge Soulstone, and The Philosopher’s Stone are all a bit crap for her so I don’t recommend taking them. 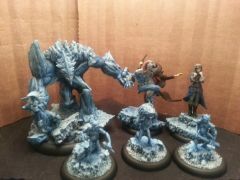 FROZEN HEART MODELS Basically every Frozen Heart model is good in a Rasputina crew just because of that ability, but several of them have some pretty amazing synergies beyond that. Most of the time, the majority of your crew is going to come from this pool of models just because of the extreme crew synergy that goes on. It’s hard to talk about Rasputina without her personal Totem, the Wendigo. 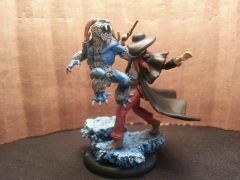 This is almost a must-take, as it’s basically a better Malifaux Child at the same cost! It's Magical Extension action lets it use Raspy’s actions at -3 Ca. This is usually used for her tactical actions, either December’s Touch to pass out Amor +2 and Frozen Heart or Ice Pillars to block off more of the board. It also has Devour, letting it just delete a Ht 1 or Paralyzed model (and on a , it also gives Raspy Fast)! Making this even better, it has Companion so after someone Paralyzes a model it can charge right in for the cheeky Devour. Snow Storm is the most expensive Arcanist Henchman and is debatably worth that cost. She can be a monster in melee, and is decent at range with three 's on her Severe, but the real reason you take her is her (0) December’s Command, which lets you place another Frozen Heart model into base contact with her. Most of the time, this is the “get Raspy up the board” or “get Raspy out of engagement” move, but it’s also nice to get a Ice Golem within range of the enemy to Smash. Her price keeps her from being an auto-take, but she can definitely bring some good tricks to Raspy’s crew. The Arcane Emissary with the Elemental Conflux brings something very interesting to a Rasputina crew – the power to use Ice Mirror through the Emissary even if it's engaged. This is basically the only way Rasputina will use her Biting Chill through another model, giving her more AP value when it gets stuck into combat. The other Ability it gets from its upgrade, Ice Bridge, gives the Raspy crew an alternative mobility bump to your crew outside Snow Storm, not incredible but nice to have. The model itself is not a huge threat but it’s good at getting in your opponent’s face. Blessed of December is an interesting one, it being the only Arcanist model with Leap with the suit built in. This lets it jump around the board very comfortably, making it a surprisingly good scheme runner! Its attack is very nice as well, though it has a very hard time against Construct models with Armor, as its best triggers can’t be used against them. Another expensive piece (kind of a trend with Frozen Heart), but it’s good at what it’s built for. Ice Golem, the much maligned beater of the Frozen Heart group. It’s slow and hilariously easy to hit, but it has Melee Expert and two very good attacks! Its Tactical Action Toss is fun to use in a pinch as well, as you can whip an injured Ice Gamin into the enemy’s face for the double tap of damage from Toss and Explosive Demise if the Gamin dies! You’ll mostly summon this in, if you hire it you'll want either Snow Storm or another movement booster to get it into combat ASAP. December Acolytes are the queens of shooting in the Arcanists! From The Shadows lets you set them up for some damage on the first turn, but be careful not to put it too far forward or you’re going to lose her really fast. Her ranged attack is what you take them for with a fantastic damage spread, built-in Slow, and built-in forced discard trigger. Those Harpoon Guns are just amazing. Their Smell Weakness Ability also provides amazing anti-Armor and –HtW as well, making them surprisingly good against other Arcanists and Ressers. Take these. Ice Dancers are ridiculously fast scheme runners, arguably even better than the Blessed for 3ss less! Combining their great Wk, Forward Momentum Ability (pushing them if they walk or charge), and Work the Crowd Action (placing a scheme marker at the end of their activation), without Fast they can move 16” and still place a Scheme Marker! It’s kind of ridiculous, but amazing. Their other Tactical Action, Ice Path, messes with your enemy’s positioning by putting a slippery patch onto the ground, very nice against models who want to charge you. Ice Gamin are the support for your crew. Summonable by both Raspy and the Mech Rider, these should show up regularly. Their core Action Bite of Winter is what makes this whole crew work! By discarding a card, models with Frozen Heart around them get +1 to ALL of the damage they do, including on blasts! So suddenly December Acolytes and Raspy are min 3 at range, and anyone Raspy uses December’s Touch on gets it as well (meaning a Frozen Heart Rail Golem using Locomotion is min 6, if you really need something dead). They are also the suicide runners of your crew, as their Explosive Demise 2 regularly punishes the enemy for trying to kill them and if you shoot them to blast into the enemy crew, you won’t mind as much when they’re killed! Silent Ones are each like a mini-Rasputina, being the only other model in the game with Ice Mirror. Their attack is okay with some very nice triggers (attack again, get a free Ice Pillar, and heal all nearby Frozen Heart models), but the big thing they bring is their (0) December’s Favor, which with Ice Mirror is a super long range heal with a trigger to heal other Frozen Heart models around the target! They’re not quite as slow as Raspy but they are easier to hit, which is helped a bit with their built-in Df trigger Frozen Statue, which makes it so any other damage they take is capped to 1 damage at a time (the first hit still does full damage). They won’t survive if the opponent really tries, but the trigger slows down their death a bit which is nice. OTHER MODELS If you don’t want to bring the Wendigo for some extra casting and the potential for Rasputina to get Fast, your other real Totem option is the Essence of Power. Like Rasputina herself this is a very slow model but it has a great aura of +1 Ca, meaning that Rasputina can be Ca 8 from a huge distance away for very reliable damage! Mechanical Rider gets a call-out since it can summon in Ice Gamin for you, and if you’re using Frozen Servants then anything it summons which dies will drop Scrap Markers for you to summon off of later. It’s also just a really solid model, and Rasputina can solve its big problems (bad survivability early-game and low min damage for its cost) with December’s Touch. Sloth is a bit of an odd one here, as he’s arguably one of the worst of the Crossroads Seven. However, if you’re playing Paralyzed Raspy then he’s actually pretty synergistic here! If you get this model into your opponents face you can lay a ton of Slow on them with his aura, and his Lullaby can force the opponent to become Paralyzed if they’re already Slow. Arcane Effigy is honestly a 100% must-take every game. Its Arcane Radiance Action dramatically increases Raspy’s harassment power, as it lets her hand out Burning or force the opponent to discard cards (she does enough damage that the card discard is probably what you really want here, but either’s good). It’s also one of the extremely few Condition removal options Arcanists have, so that’s handy. 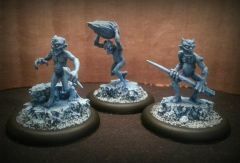 Hoarcat Prides are really great value under Rasputina as well, giving her a fair bit of wounds at an amazingly low price, made all the better with Manipulative and Small Target. Their two attacks are also perfect for her, as Fangs and Claws can become min 4 with December’s Touch if they're above half wounds and Devour is great if you’re playing Paralyzed Raspy (it needs a much higher card than the Wendigo to do this though). Union Steamfitters are nearly auto-takes if you're taking the Frozen Servants upgrade, as you're really going to want their ability to drop Scrap Markers each turn. Also, it’s important to note that on anyone who doesn’t already have Armor, you can combine December’s Touch with a Union Steamfitter's Weld Metal Plate to suddenly give that Shastar Vidiya Guard or whoever else Armor +3! Also: literally any beater model. That might seem like a bit of a cop-out, but her ability December's Touch giving out Armor +2 and Frozen Heart (and thus access to an Ice Gamin's Bite of Winter) lets her really crank up both the survivability and the damage that anyone in the faction has access to! We have a lot of min 2 damage models, but with Raspy they’re basically all min 3. Just throwing out a few examples, an Oxfordian Mage can Furious Cast at 3/4/5 with their amazing triggers, the Shastar Vidiya Guard can suddenly be throwing out min 2 Chakrams (and they do love the extra tankiness), and if you want to get a bit fun with things even generally weaker models like Wrath can suddenly become serious threats (his weakness is how frail he is after all, Armor +2 really fixes that). TIPS & TRICKS The Biggest Boom (requires Ice Gamin and Arcane Effigy) This tip's a bit obvious, but as Rasputina's main job is to blow stuff up, if you can it's always best to set her up for success. Have a nearby Ice Gamin put up Bite of Winter and have your Arcane Effigy give her the Radiance condition before she goes. Also make sure that you have your LOS-giving Frozen Heart model in position, and to keep your enemy on their toes don't just have one - the more angles you have, the harder to defend against her attacks. New Angles (best with Wendigo) One thing to keep in mind is that you don't need to (and shouldn't) think only of your Frozen Heart models as your LOS angles. Having your Wendigo use December's Touch on a non-Frozen Heart model to give it that condition, then having that model run into a new LOS angle can really catch your opponent off guard. The more you force your opponent to consider all of your models' board positioning, the more likely you'll catch them off guard in some direction! Peekaboo (requires Cold Nights) The really cheeky thing about Ice Pillars is that they last until the model who placed them next activates. So for turn 1 you can have Raspy move up and put some down to block LOS and enemy charge lanes so that your crew can safely get into a good position. Turn 2 you can get yourself all set up, have Raspy go (removing the Pillars) and fire off her spells into the enemy's crew, and finish it off by having her put down Ice Pillars again! You could do this each turn of the game, always moving the Ice Pillars to wherever you need to block LOS and charges lanes at that time. Turn 1 Explosions (requires December Acolyte or a fast model and a movement effect) If you take a very fast model like Blessed of December or Ice Dancers, or aggressively place December Acolytes, then have Snow Storm pull Raspy nice and far forward you can have Raspy fire into the enemy's deployment zone potentially (really depends on cover and LOS here) to really force them to rush out and do some nice, mostly safe damage! You're probably going to need to put some Ice Pillars down to block LOS to the fast model, or use December's Touch to help it survive the inevitable counterattack. Carpet Bombing (requires Snow Storm and Ice Gamin/Golem) If Snow Storm is about to die and you get her within Explosive Demise range of (ideally several) enemy models, you can use her December's Command to pull forward a 3 wound Ice Gamin or 2 wound Ice Golem into base contact with her and within Explosive Demise range of those same enemy models. This makes it so when Snow Storm dies, the Ice Gamin/Golem also dies, causing two Explosive Demise's to trigger and do some serious mass damage to the enemy! Gone Bowling (requires Ice Golem, best with Ice Gamin) One thing you can only do with the Ice Golem is throw your smaller models around, either to get new Ice Mirror positions or to throw an Ice Gamin into a clump of enemy models. You can then randomize Raspy's December's Curse into the combat - if you end up targeting an enemy, do your duel as usual, but if you hit the Ice Gamin then try to cheat its Df as low as possible to ideally give Raspy a straight or positive flip. If you can hit that moderate or severe damage, your opponent will be forced to take your Blast damage followed by more damage with the Ice Gamin's Explosive Demise! Do You Want to Build a Snowman (requires Frozen Servants, best with Scrap Marker generators) Frozen Servants is enough of a game-changer to really get its own call-out here. The most important thing to keep in mind is that to be able to use this upgrade, you need to have some way of putting Scrap Markers on the board. The common choices for Arcanists can all work here: either having a Union Steamfitter placing a Scrap Marker with its (0), or having Joss, a Large Arachnid, or The Beast Within kill a model for bonus Scrap Markers. While these will help the engine get a-rolling, other options include hiring a Mechanical Rider to summon low-wound units with the intent on having them die and drop Scrap Markers, or just hiring extra Constructs and have them die during the game. Now, the models that you'll be summoning are both very handy to get on the board for just an AP. The most obvious power move here is to drop one or more into a clump of enemy models, forcing them to deal with them (and when they do, deal with its Explosive Demise). Amusingly, the summoned models coming in damaged is actually beneficial: the lower wounds, the closer they are to their Explosive Demise. The other major perk to summoning in these models is that you'll be putting new Ice Mirror angles on the board. Using Raspy's first AP to create a new Frozen Heart model disengaged and with Cover-free LOS to enemy models can be wonderful, and really increases the amount of attack angles you'll force the opponent to think about. The Ice Golem requiring a high as well as a Soulstone means it's not going to happen too often, but getting it off and summoning in a free 9ss model with Melee Expert can be a real swing in your favour. It has to survive to its second activation, but getting a summoned Ice Golem use its (3) Smash on an enemy model can put a lot of damage out! 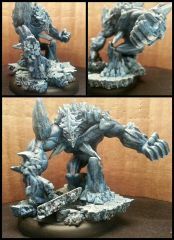 Summoning in some Ice Gamin is going to be a much more common choice, with it needing just a mid (also, the Wendigo can do this on a high ), both to give you more ways to get Bite of Winter on your friendly models as well as putting cheap new Ice Mirror angle targets wherever Scrap Markers are. Since both of these models drop Scrap Markers when they die, you're not really giving anything up by summoning them in (oh, they killed your Ice Gamin? Turn its Scrap Marker into an Ice Golem next turn!). It might initially look like the only spell you’ll be using with Rasputina is December’s Curse but between her control over the board with her Ice Pillars, her support with December’s Touch, her powerful Paralyzed combo of Freeze Over and Shatter, and her summoning options with her Frozen Servants upgrade she actually has a surprisingly deep amount of playstyle options. Regardless of how you play her, she’s still not really going to want to be engaged most of the time, but the flexibility she has makes her a legitimate choice and a threat the opponent can never ignore. If you have any tips and tricks on things you do or models you hire with Raspy that I didn't mention above, please post it below! W: ME1 metal Blessed of December. Hey guys and girls, I'm going to be in a shifting loyalties campaign and I was hoping for some crew suggestions to start with I have Ramos crew, Ironsides and Raspy I was thinking of going with Snow storm, Silent one and 2x Ice gamin for week one. It seemed like a good/fun start. 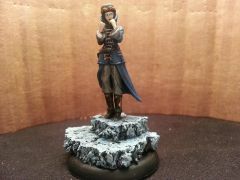 The next model I would get would be December Acolyte since they are too good to pass up. I know my opponents will be Outcast (Leveticus) , Outcast (Von Schill) Guild (Peridta), and maybe Ressers. I named those masters here cause the players have those crews and they are the players favorite masters right now. Any suggestions or ideas would be great. I also had a few questions about blasts and triggers so...Snow Storm's attack Ice tornado damage is 2/3//3 what is the damage of the third blast? My understanding of blast is it works downward from max to min. For example Raspy December's Curse is 2/4/5 so if you get max damage the target takes 5 and first does 4 and the second does 2. My second question is about triggers. How many times can you trigger the same trigger/repeat an attack? Ive noticed on Snow storm has a trigger "Overpower After damaging, immediately take this action again against the same target. This action may not declare triggers". So here only once per action so at most twice per activation (lol I can read )but Raspy as "Biting Chill One thousand Cuts: after damaging, immediately take this action again against the same target" so since it does not have the line "This action may not declare triggers" that means you could in theory you could do it forever right? This was just and easy example Ive noticed this same sort thing on other cards guild, outcast etc and wanted a second opinion. Thanks for the help and ideas I look forward to the responses.